New Zealand’s varied marine animals are brilliantly portrayed in this vibrant stamp issue: Beyond the Coast. The beautiful artwork was inspired by the Poor Knights Islands, which lie 23 kilometres off New Zealand’s Tutukaka coast in the upper North Island. 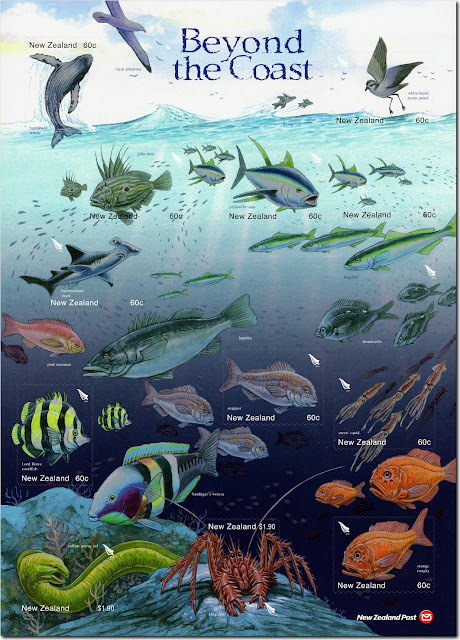 A total marine reserve and nature reserve, these 11-million-year-old islands are rich with incredible marine life. New Zealand’s 15,000 kilometres of coastline is home to magnificent coves, bays, harbours, sounds and fiords. However, beyond this irregular coastline lies a roughly 4.3 million square kilometre exclusive economic zone that hosts an array of unique marine life. More than 15,000 species are known to live there, of which many are migratory. 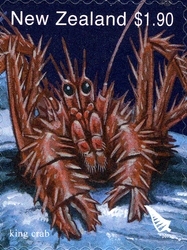 New Zealand's isolation means that a large number of these species are unique to our island nation, and scientists believe that many more have yet to be found. 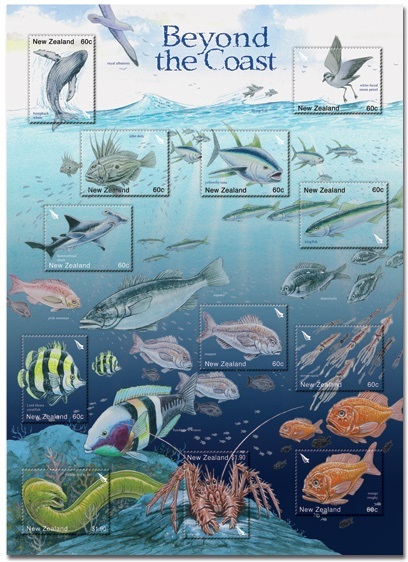 The full sheet - Location guide to stamps below. The self-adhesive stamp sheet consists of 12 stamps (10 x 60c and 2 x $1.90 stamps) and has been enhanced with silver to really bring the creatures to life. Capturing a unique part of our stunning wildlife, this stamp issue really is a tribute to New Zealand ‘beyond the coast’. 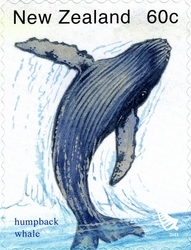 60c - Humpback Whale (Self-Adhesive). 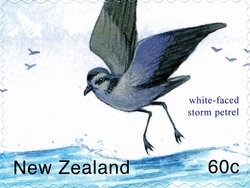 60c - White-Faced Storm Petrel (Self-Adhesive). 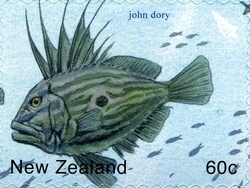 60c - John Dory (Self-Adhesive). 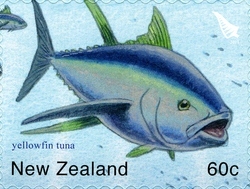 60c - Yellow Fin Tuna (Self-Adhesive). 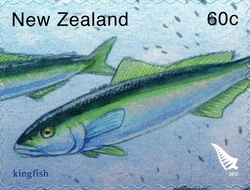 60c - Kingfish (Self-Adhesive). 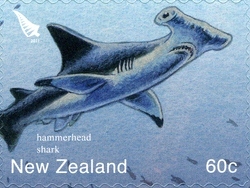 60c - Hammerhead Shark (Self-Adhesive). 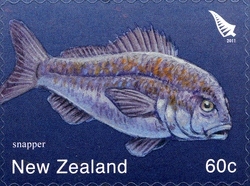 60c - Snapper (Self-Adhesive). 60c - Arrow Squid (Self-Adhesive). 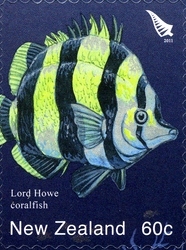 60c - Lord Howe Coralfish (Self-Adhesive). 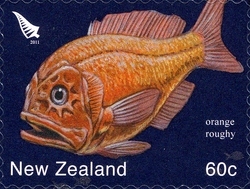 60c - Orange Roughy (Self-Adhesive). $1.90 - Yellow Moray Eel (Self-Adhesive). $1.90 - King Crab (Self-Adhesive). 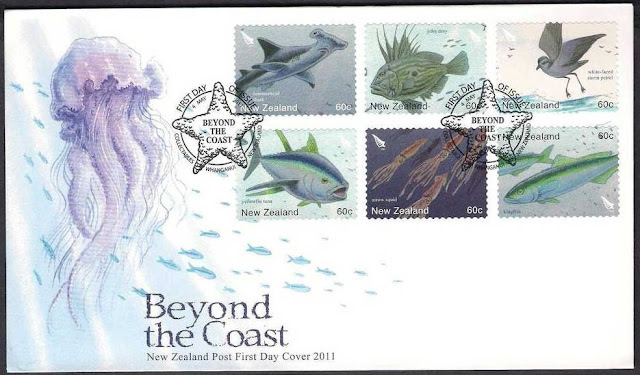 Because there were 12 stamps, there were two First Day Covers with this issue. 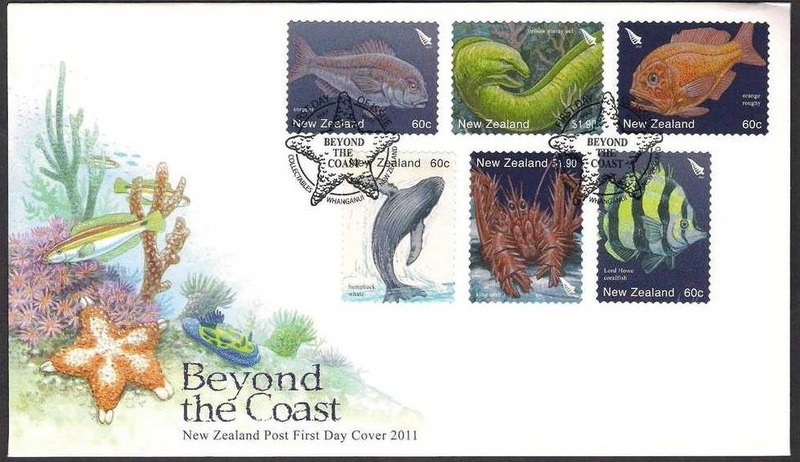 Each cover had a different undersea design and came with 6 of the stamps. I really want you to enjoy the full design of this sheet so I've included a second image of the sheet. While details come out better than the one above, you need to look hard to see the individual stamps. 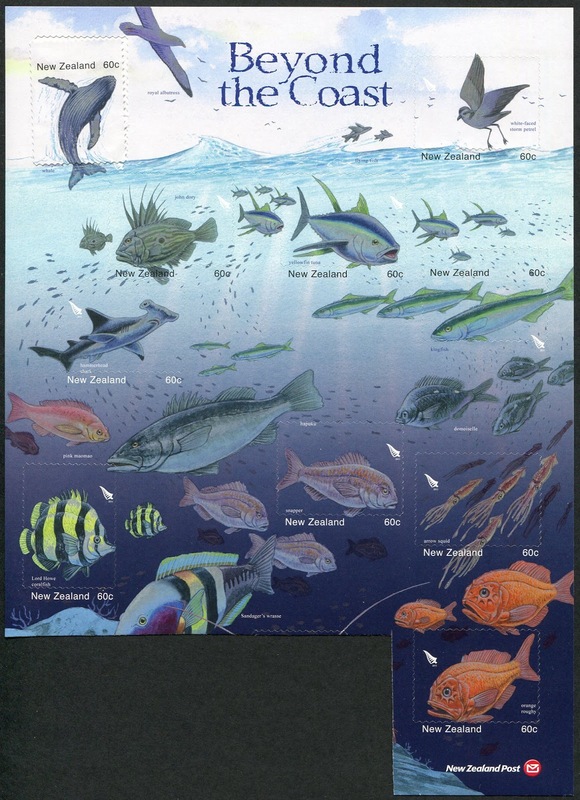 While all of these creatures are unlikely to be found within close proximity of each other in real life, the stamp sheet is a visual delight and is reflective of the diversity of New Zealand’s ecosystem. The white-faced storm petrel flutters above the surface of the water, while lurking below is a range of fish from the popular snapper to the yellow moray eel and the king crab in the depths of the ocean. The full sheet with a perforation shift upwards that has left the words "New Zealand" and the value off the bottom of each sheet. In a case like this where all the stamps were issued on one special sheet, a printing error will often affect most, if not all of the stamps. Date of issue: 4 May 2011. Number of stamps: 12 x self-adhesive stamps. Denominations: 60c x 10, $1.90 x 2. 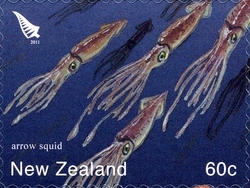 Stamps and first-day cover designed by: Dave Gunson, Auckland, New Zealand. Number of colours: Four process colours plus MetalFX. Stamp size and format: 52mm x 37.5mm (nine horizontal, three vertical). Paper type: Tullis Russell red phosphor PSA self-adhesive 210gsm. Number of stamps per sheet: 12. 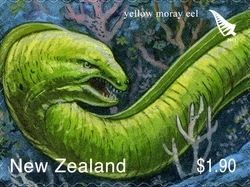 Period of sale: These stamps remained on sale until 3 May 2012.